Tens of millions of bison used to roam the plains of North America until the slaughter of the 19th century left just 23 animals alive in a remote valley in the Yellowstone national park. Now Native American tribes are playing a key role in their reintroduction. The bison, or the buffalo as native Americans call them, are North America’s largest land mammal and are one of the only large mammals to survive the Ice Age extinction. 20-30 million bison used to roam the North American prairies, until the arrival of white settlers and the decision of the US government to slaughter the great herds so as to deprive the native Americans of one of their most important spiritual and cultural symbols. 23 bison survived in a remote valley in Yellowstone and today that same herd is 4,000 strong and is regarded as one of the most genetically pure bison populations because it has never been interbred with cattle. Then in 2007, the native American Fort Peck Reservation decided to move some of the bison from Yellowstone to their own reservation to create a pure-bred herd. But the project was delayed, as many of the Yellowstone bison had the disease brucellosis, which ranchers were afraid could be passed to cattle. Eventually, after battling anti-bison legislation from the Montana congress, the Fort Peck tribes got their first Yellowstone bison in 2012. Then in 2014, 13 tribal nations, comprising of eight reservations in the US and Canada, signed the so-called ‘Buffalo Treaty’, which aims to bring back free-roaming bison to both the US and Canada. 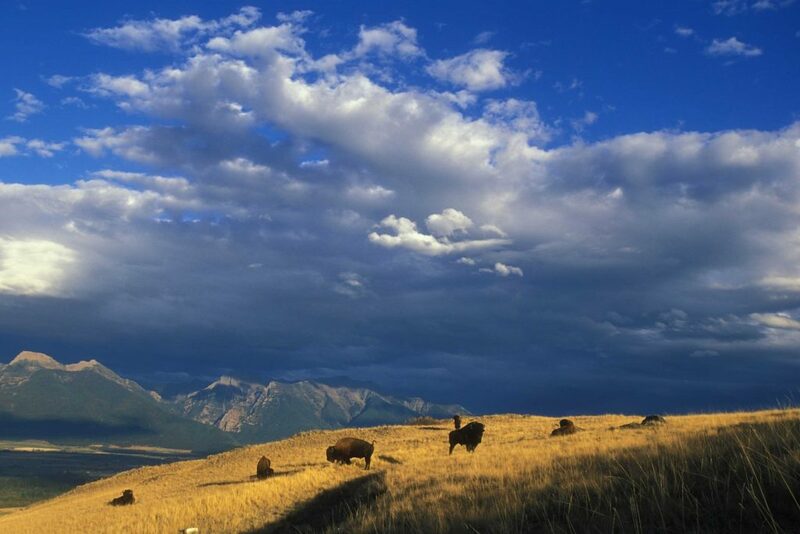 Blackfeet Reservation, also in Montana, received 89 genetically pure bison from Elk Island in Canada and hopes they will be able to roam free up to the Glacier and Waterton Lakes national parks and as far as the Blood Tribe Reservation in Canada. 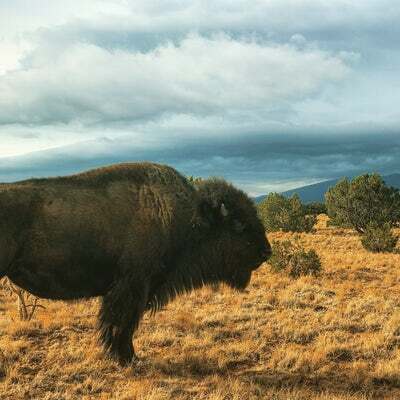 The Y2Y initiative aims to create a huge wildlife corridor from Yellowstone in the US to the Yukon in North-Eastern Canada, which now hopes to include buffalo as well as wolfs, bears, coyotes and other wild mammals. Jonathan Proctor, Rockies and Plains program director with the NGO Defenders of Wildlife, explained that the native American tribes of the northern plains have been key in the restoration of wild bison. He hopes that soon there will be herds of more than 10,000 of them. 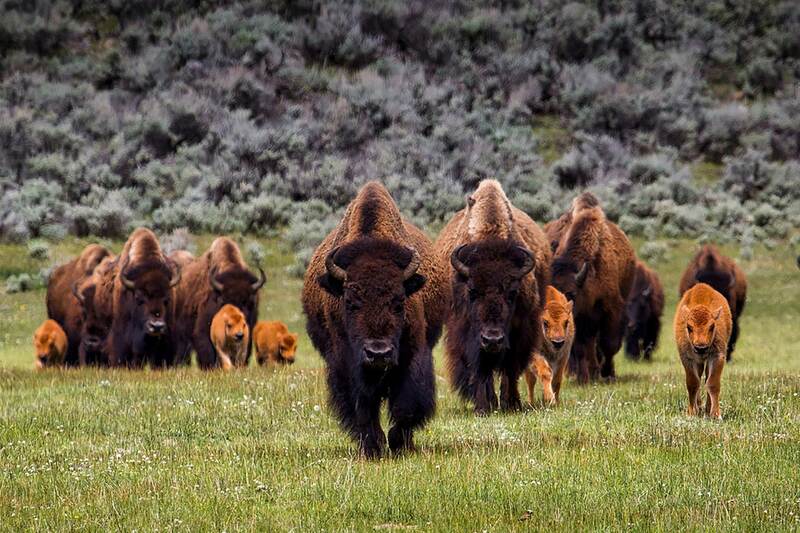 “We’ll never see bison roaming the entire Great Plains again,” said Proctor. “We’ll never see 20 million to 30 million bison again. No one is trying to go back in time. We’re trying to go forward. We’re trying to restore this important animal where we can, where people want them, and to the level where they will help restore the natural balance,” he told the Guardian. Fort Peck is aiming for a more modest 2,500 buffalo in a conservation herd with up to 40,000 hectares to roam around. Native American tribes have also been key in the conservation of wolves, bears and swift foxes.